Product prices and availability are accurate as of 2019-04-18 22:00:17 UTC and are subject to change. Any price and availability information displayed on http://www.amazon.com/ at the time of purchase will apply to the purchase of this product. Make the purest drinking water with your own home system. Great in the kitchen: Improve the taste of your cooking, coffee, ice, and drinks. 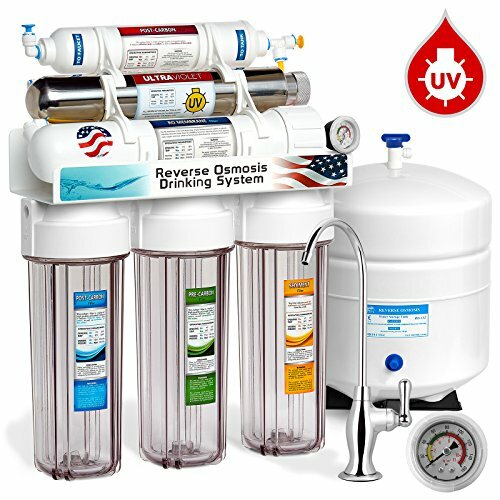 Experience true UV Reverse Osmosis purification and sterilization. Safe filtered fresh tasting H2O: Removes up to 99.99% of contaminants including Lead, Chlorine, Fluoride, Cyanide, Giardia, Radium, Asbestos, Calcite, Heavy Metal, Bacteria, Viruses, Pharmaceuticals, and over 130 other contaminants. Get setup fast with our Quick Connect tubing system. The UV light is equipped with a warning alarm that will alert you when the power of the UV falls below the germicidal range. Includes fast flow faucet with 0.8 GPM delivery. A compact system made to fit under counter in a cabinet. Best for house, apartment, residential, well water, industrial, rv, machine, and office uses. Certified by an independent laboratory to NSF standard 58. 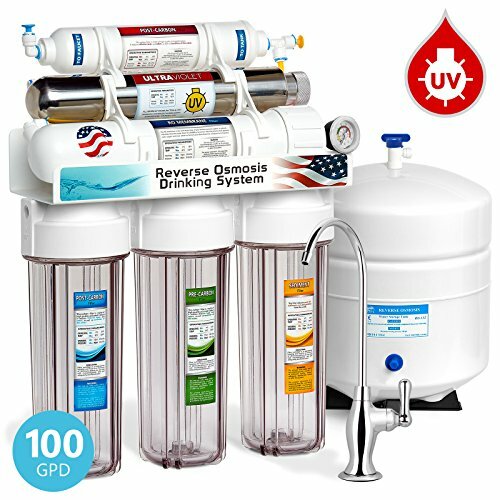 UV-C Ultraviolet light kills viruses, organisms, and bacteria in your water. 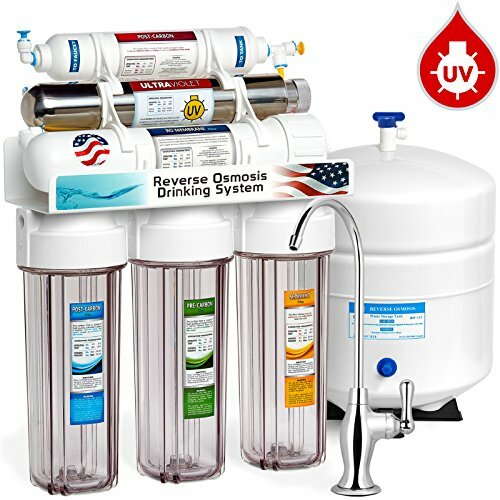 Comes with 4 gallon (3.2 gallon water capacity) storage tank and tank stand. Includes all filters needed for setup and first 6 months of use. Can be wall / cabinet mounted or freestanding, made for indoor use. Can be installed undersink, in a basement or other remote locations, you may need additional tubing or a delivery pump depending on how far away you plan to install or if you plan to link to a refrigerator as well. 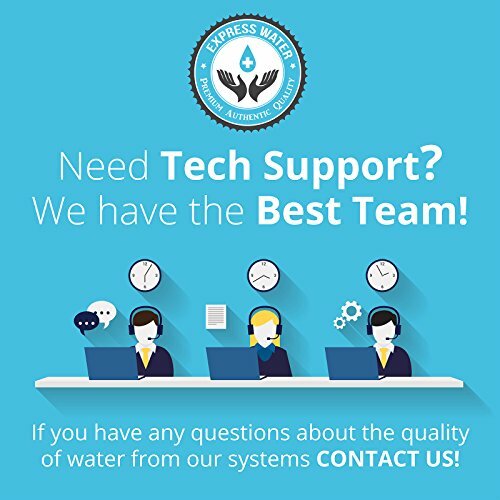 For every one gallon of water produced the system discharges between one and three gallons (depending on the pressure and quality of your incoming water). The system is compatible with 3/8" and 1/2" under sink connections. Includes filter housing wrench. Operates on 40-80 PSI water pressure, you may need a Booster Pump or Pressure Regulator depending on your water pressure. The water is cleaner and more convenient than any pitcher, faucet filter, or countertop systems. Express Water’s 6 Stage Reverse Osmosis Ultraviolet Water Filtration System ROUV10DCG is the complete solution for your drinking water.